How did you learn about ABA? 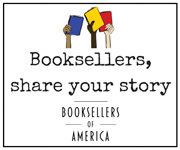 Please contribute to ABFE (American Booksellers for Free Expression) to support the important work of protecting free speech and fighting censorship. The ABC Children’s Group is dedicated to growing and expanding the reach of children’s books. Please note: Dues paid to the ABA are not tax deductible as charitable contributions for income tax purposes. However, they may be tax deductible as ordinary and necessary business expenses subject to restrictions imposed as a result of association lobbying activities. ABA estimates that the non-deductible portion of your dues – i.e. the portion which is allocable to lobbying – is 10%.